(Wendake, Wendat Territory/January 27, 2016) Chiefs and Representatives from nine Algonquin First Nations met today while attending an Assembly of First Nations of Quebec and Labrador Chiefs’ Meeting to have a presentation on the proposed developments for Lebreton Flats and while there they will also discuss their ongoing opposition to the proposed Windmill Development Condo Project at a sacred waterfront area on the Ottawa River known by the Algonquins as Akikodjiwan. 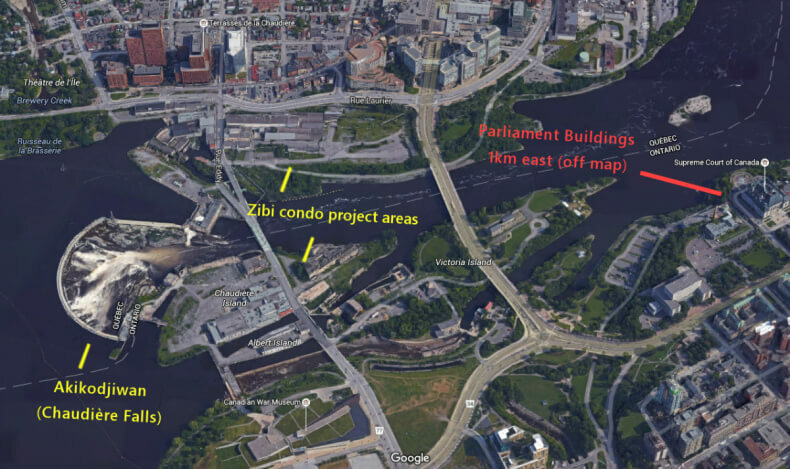 The regional (AFNQL) and national (AFN) Chiefs organizations have duly adopted support resolutions endorsing the position of the nine Algonquin First Nations who oppose the condo project, inappropriately named by the development company as the “Zibi” project the Algonquin word for river. Only one Algonquin First Nation, Pikwàkaganàn supports the condo project out of the ten communities that form the Algonquin Nation. The nine Algonquin First Nations are seeking the return of the sacred waterfront area and islands to Algonquin control and management as an Algonquin Cultural Heritage site to maintain a permanent presence in the National Capital Region, which is unceded Algonquin Territory. The Algonquin Nation Chiefs are coming to Ottawa on February 5, 2016, for a meeting with the National Capital Commission regarding the Le Breton Flats land use.